Tired of tedious keyframing? Take animating into your own hands (literally) with our powerful motion-building software: Action Pro. Easily transform real-world motion (from your mouse or fingertips) into professional 2D and 3D animations. No clunky graphs. No numbers. Draw your moves and watch your animation come to life. Go beyond simple lines and figures with the power to create 3D animations from 2D inputs and 3D animation paths. Didn’t get your drawing quite right? No sweat. You can easily condense, stretch, and smooth your animation until it’s perfect. Want to see your creation from every angle? Adjust the orthographic or free perspective cameras to change your point of view. Action Pro has been developed with you in mind. Our dark interface helps your animation to pop out of the screen, and we’ve gotten rid of unnecessary clutter. Minimal buttons mean that you only see what you need, and a library of keyboard shortcuts allows you to create the fast workflow you want. In addition to using your mousepad, you can utilize Action Pro’s accompanying free app, Action Pencil (coming soon to the iOS App Store) for iPhone or iPad. With this, you can draw motion using an Apple Pencil or your fingertips, and see it appear in real-time on the Canvas panel. Action Pro is entirely GPU-accelerated and non-destructive. What does that mean? Our software retains all your data so you can use modifiers to randomize, smooth and stretch your frame-independent recordings or entire tracks without losing quality. Undo actions without regret, your edit history is safe with us. Don’t quite know where to start? Action Pro comes ready-prepared with animation presets so that you can start experimenting on your first go. From spirals to perfectly square movement, each preset is customizable so that you get the exact movement you want. Action Pro lets you set the scale of your exports— so you can apply the proportions of your 10 cm animation path to a real-life composite. Export single animations, sequences or whole projects with just one click, then finish off your masterpiece with some killer VFX in HitFilm Pro. 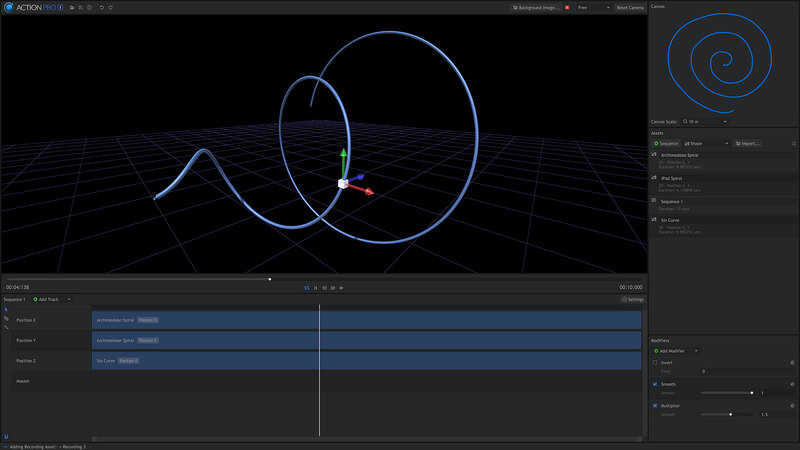 Fine-tune the details of your animation with full control over playback and animation speed. Take it slow, speed things up, or watch your creation in real-time at full resolution. Early-adopters and animation artists, we want to hear from you! Action Pro marks our step into motion-building software— and we need you to make it the best it can be. Tell us what you think in the FXhome forums! The sky’s the limit - jump onto the Action Pro train now and be around for the next exciting steps. We’re thinking VR support? The easy-to-use motion capture software.